On 26 September 2018 all eyes will be on the US Federal Reserve's decision regarding the Federal Funds Rate (the technical term for interest rates). On this day, at 7pm BST / 8pm CET, the central bank will choose between three options: keeping interest rates on hold, cutting interest rates or increasing them. The actions they take have a huge impact on the direction of the US dollar. However, what is most interesting is that US Federal Reserve Chairman, Jerome Powell, will be holding a press conference 30 minutes after the release at 7.30pm BST / 8.30pm CET. It has been suggested by various analysts that more press briefings means more scope for further rate hikes. In August, this led to odds of a rate hike in September of 96%, with a 60% chance of another occurring in December. Before we look at how you could trade this event, let's look at why interest rates are so important in the currency market. To keep track of the announcements as they occur, why not check out our Forex calendar? The calendar provides useful information regarding forecasts, figures, statistics and more. Interest rates matter to currency traders, because they affect the demand with which international investors want to invest in a specific currency. For example, if you could choose between a savings account offering of 0.5% interest or 2% interest, which would you choose? Most likely the 2% interest account. Currencies work in a similar way. Countries which have a higher interest rate tend to see more capital flows, as institutions want to receive a higher interest rate. The increase in capital flows tend to lead to a strengthening currency. Conversely, countries which have a lower interest rate tend to see more capital outflows, as investors move their money elsewhere searching for a higher interest rate. These capital outflows, tends to lead to a weakening currency. One important lesson to remember is that markets move on the anticipation of an event happening. However, there are still ways to trade on the day of a news event. Traders who have an understanding of the bigger picture can use price action to their advantage. 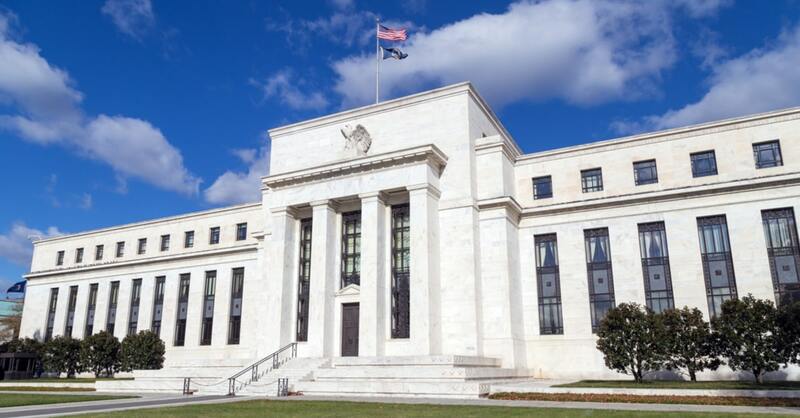 As it has widely been reported, the Fed are more likely to increase interest rates this month, and most traders will be looking to position themselves for that possibility. Let's have a look at the four hour chart for USDCHF during the last time the Fed increased rates and delivered a press conference thirty minutes later - on 13 June 2018. The highlighted blue box (shown above) displays the market activity on 13 June 2018 during the US Federal Reserve's decision to increase interest rates. The long tail candle shows that buyers initially pushed the market higher on the back of the interest rate hike. In this instance, the US dollar rose against the Swiss Franc. However, the market dipped afterwards. Why? Because in the FOMC meeting concerns were expressed of a major escalation in the ongoing trade war with China. The traders who were looking at the bigger picture may have waited till after the press conference to see how the market settled. The market rejected the previous low on 12 June 2018, and then traded back up to the high point made during the Fed's announcement. Some traders took this as a sign to buy the US dollar. In this scenario, traders could have traded a simple breakout of a trading range. 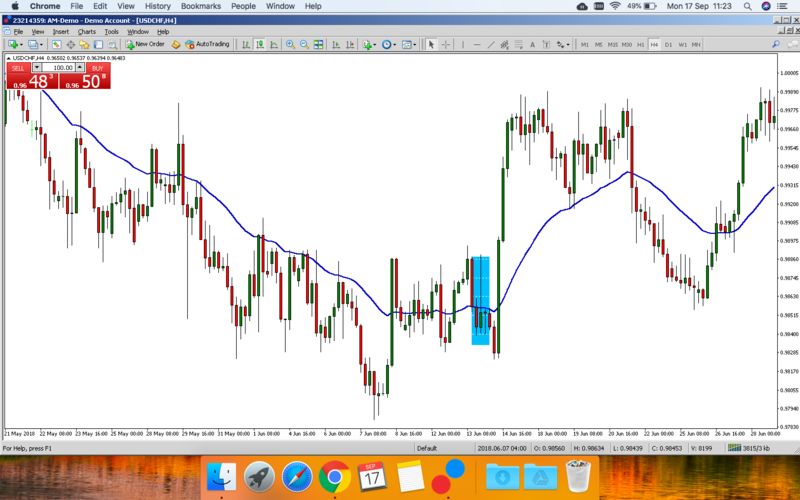 For example, If a trader entered the market at 0.9896, with a stop loss order of 0.9823, the trader would then profit when the USDCHF trades above their entry price, as well as from the spread (the difference between the buy price and sell price of a market). If the exchange rate stayed at or below their entry price, then the trade would have been a loss. However, the loss would be limited to where the stop-loss is placed. Trading one standard lot of 100,000 units would result in an approximate USD 757 loss. If the trader decided to exit the trade at the next major high price level, then the trade would have been closed on 15 June at 0.9983, resulting in an approximate USD 901 profit.